I'm very excited for yet another Illamasqua giveaway! If you follow me on Instagram, you'd have gotten a hint as to today's prize! If you haven't read about the giveaway and the rules, click here. 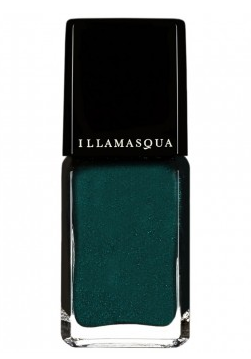 Day 11's giveaway prize is Illamasqua Viridian, perfect for the holidays! Fill out the Rafflecopter widget below to enter! And check back tomorrow for the reveal of the Philosophy brand prize! Also, don't forget that the Zoya MatteVelvet giveaway is through midnight on 12/5, so these giveaways will end at the same time! Hands of Hope? Thanks for the chance! Philosophy Eye Cream perhaps? Thanks for the chance to win! I hope to see something just as festive, thank you for being so generous! Something with a nice, festive scent! I never had anything from that brand before so anything! !